I want to thank, each reader, and followers of automationchampion.com, for their support and feedback(s). Some of you requested me to write a blog post to explain (1) MALFORMED_ID Error; and, (2) how to solve it. I have and will continue to, try my best to incorporate suggested topics, from readers and followers of my blog, in my upcoming articles. Process Builder is a way of automating business processes. It is an upgraded version of the Workflow Rule. Whenever a user creates a process, the system automatically creates a Visual Workflow – and a Flow Trigger (which is now deprecated) – to call the Flow. Creation of the Flow happens behind the scenes; and therefore, a user does not need to interact with these ‘shadow’ (behind the scenes) Flows. Process Builder is a powerful tool for system administrators and developers to implement business processes without writing code. However, with great power comes great responsibility – If a user starts creating a new process for each requirement – or creating processes without understanding Salesforce limitations – then, a user may encounter many issues, either in future or, during testing/deployment phase. In my last post Getting Started with Process Builder – Part 66 (How to fix FIELD_INTEGRITY_EXCEPTION Error), I discussed how to solve FIELD_INTEGRITY_EXCEPTION error by passing the correct record ID to Process Builder action. 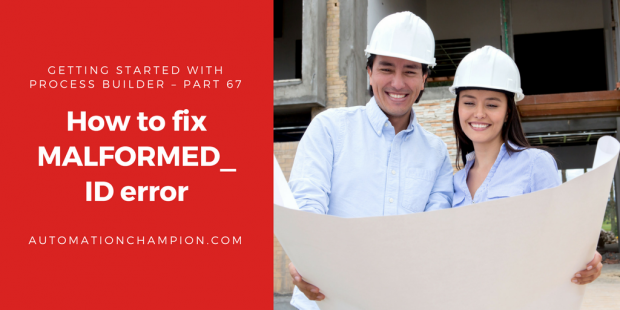 This article goes one step further; it explains another common error – MALFORMED_ID Error. The article shows – (1) why errors could occur; (2) how to identify errors (by using a system generated fault email/debug log); and, finally, (3) how to solve the problem. Donna Serdula is working as a System administrator at Universal Containers (UC). UC implemented Account Management a few years ago in Salesforce. Serdula has a requirement from her manager that, as soon as a Contact gets created, without assigning it to an account, then auto assign such Contacts to a global account ‘Customers with no account’‘. ‘Global account’ named ‘Customers with no account’? What is that? Well, in this case, a ‘global account’ is nothing but a ‘holding place’ for unassigned contacts – i.e., contacts, that, when created, could not, or did not, get assigned to an account. For instance, suppose a User creates a contact named John Smith; but, at this point, the User is not sure to which account John Smith belongs to. Leaving Account field blank, while creating a contact, may create data integrity issue(s). Therefore, it would behoove a User to collect all unassigned contacts in one central place – in our case, that would be a global account named ‘Customers with no account’ account. Let us continue with our aforementioned John Smith use case. Now, suppose, that few months later, the User learns that John Smith works for Acme Corporation, and therefore, he belongs to Acme Corporation Account. So, in a situation(s) like this, to maintain data integrity, when creating a John Smith contact, the User can assign John Smith to ‘Customers with no accounts’ ‘holding’ account. And then, as soon as the User finds out that John Smith belongs to Acme Corporation, the User can click on the Contact Tab, look for John Smith, and then, update John Smith’s Account from ‘Customers with no account’ to Acme Corporation. A user mostly encounters a MALFORMED_ID error when he/she populates(1) a lookup field, ID with invalid characters; or (2) populates an ID with length less than 15 characters. For example, while updating a contact via Process Builder if, in the place of AccountId, a user passes a 14 digit ID of an account record or ABC in place of account ID, then, the user will encounter MALFORMED_ID error. Below, I will show you how to avoid getting a MALFORMED_ID Error while using the Process Builder. First, I will update a contact by passing a wrong ID (14 digits account ID) for contacts that are not assigned to an account when it is created. This will generate a MALFORMED_ID error because you are only allowed to pass 15 digits valid account ID. Next, I will show you how to identify the root cause behind MALFORMED_ID error followed by a way to solve it. 2. Click on Setup | Build | Create | Custom Labels. 4. Our next task is to create a Process Builder on the Contact object to update the account Id, if the contact is not associated with an account. Click on Name | Setup | App Setup | Create | Workflows & Approvals | Process Builder. 6. Click on Object node to add object and then select Contact object. For the entry criteria, Select when a record is created or edited, as shown in the screenshot below. 7. The next task is to add Process Criteria. To do this, click on Add Criteria, and then, enter Name, Type of action and set filter conditions as shown in the following screenshot. –> If you don’t know about custom Label and how to use it in Process Builder, then you must read this article Getting Started with Process Builder – Part 60 (Just say no to hard-coded ID). Once you’re done click on Use this Formula (#5) button. Add a row to associate a contact with global account – in our case, ‘Customers with no account’. –> As mentioned earlier, the reason behind the error is, we are updating Contact record’s Account_Id field with invalid record Id – in the current scenario, with a 14 digit record ID instead of a 15 digit record ID. If you see MALFORMED_ID errors, it means that the field is expecting a valid Salesforce ID. A valid Salesforce ID means that an ID that meets ID field’s requirements, to resolve MALFORMED_ID error. To fix the MALFORMED_ID error in a Process Builder or a Flow, you have to pass the correct Id for a lookup field. As we are using Custom Label to pass Account Id, now we will update the custom label with correct ID for the account. 3. Once done, click on the Save button. –> If you are using Process Builder to dynamically pass the ID (Like [Account].Id or something like this) then update your Process. At the end, you have to make sure that you are passing correct ID through the lookup field. Once you are done, click on the Save button. Notice that, Contact is created and assigned to the Global account (Customers with no account) record by the Process. I had a problem on the Process Criteria, where I was picking [Contact].Account.Id instead of [Contact].AccountId (without the dot ‘.’). Once I changed it, it worked.